Got back late and went into the kitchen. Where I noticed something very peculiar. 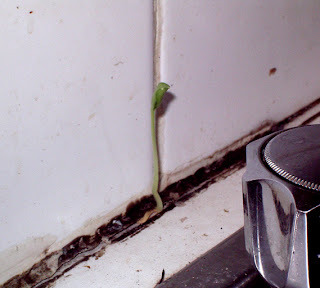 Unbeknownst to me, at the back of the kitchen sink where it meets with the tiles...a small piece of cress was growing. I hadn't noticed it prior to this day, and it appeared to be fully grown. It was pretty amazing, and I didn't have a video camera at that time (as I had only borrowed one previously) So it was a shame that I couldn't capture it in sustained time, as well as single moments. I had the dilemma that my housemates might return soon, and possibly (although perhaps unlikely!) they might clean the sink etc. I took that gamble and ran (literally) to get the batteries. Again not the best shots in the world. But it was another encapsulated moment. An adopted object.